To say the least, the 2015 World Championships was an incredibly challenging regatta for Ellen and me–emotionally, mentally and physically. It was not the overall outcome we wanted nor expected, but at the end of the day, we got Olympic qualification for the women’s double taken care of (mini fist pump) and that was the critical mission. Sometimes things just don’t fall your way and we faced one too many hurdles last week to get on the podium. From illness to simply “off” rowing, we were nowhere near being in top form. As I’ve hinted before, the women’s double sculls is possibly the most competitive event. You can’t come into any race at less than 100% and expect to do well. These are the best crews comprising the best athletes in the world. Last week, spots 1-11 (2016 Olympic qualifying positions) were separated by only a few seconds. In the double, this equals about the length of the boat, which is a very tight margin in a very deep field. To give you a comparison of similar boat size: in the women’s pair event, the gold medal to bronze medal position was a spread of eight seconds. Eight seconds behind first in the women’s double puts you well into the C Final. Ellen and I squeaked through Olympic qualification with an 11th place overall finish. Photo courtesy of Row2K. In the double, any race could go any way with hundredths of seconds determining your fate; we struggled and just didn’t have things fall our way. We came into the regatta a medal favorite after nearly beating World Champion, New Zealand at World Cup 2 in June, but instead finished 11th, taking the last Olympic qualifying spot. The World Record holder and 2015 bronze medalist, Australia finished 10th. Last year’s World Championships silver medalist, Poland didn’t even medal. While only a matter of seconds separates the depth of our field, it doesn’t ease our devastation and disappointment. The silver lining is that in the big picture, we were still incredibly close for having struggled as much as we did. Last year’s World Champions, New Zealand took gold; Greece took silver; Germany took bronze. These crews are top-notch and had a great regatta. I’m continuously especially impressed by Team New Zealand who has definitely figured out how to field a winning team. 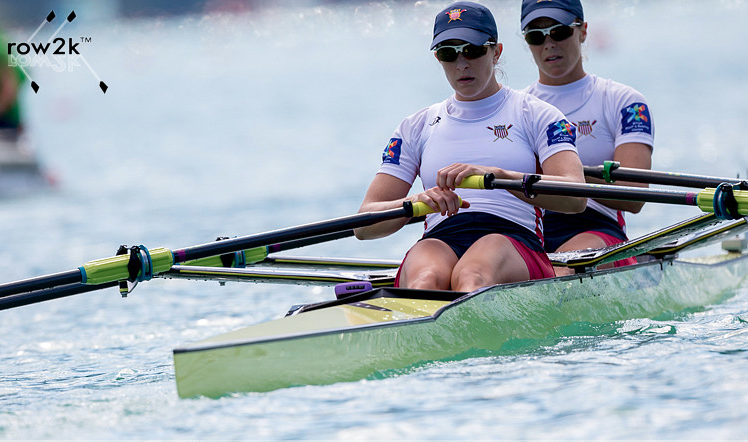 With their women’s eight taking silver and their men’s eight qualifying their boat for the Olympics with a fourth-place finish, they’ve proven that they not only know how to expertly move the small boats, but can dominate the powerful eights as well. On a higher note, the United States Women’s Rowing Team qualified EVERY boat for the Olympics. That’s right, we’re a bunch of badasses. I’d say the highlight of the regatta was the women’s quad beating reigning World Champions, Germany in a convincing win. It was impressive and I couldn’t be happier for senior team member and friend, Megan Kalmoe who has been a key figure in that boat over the past several years. She definitely finished out her last World Championships with a bang. 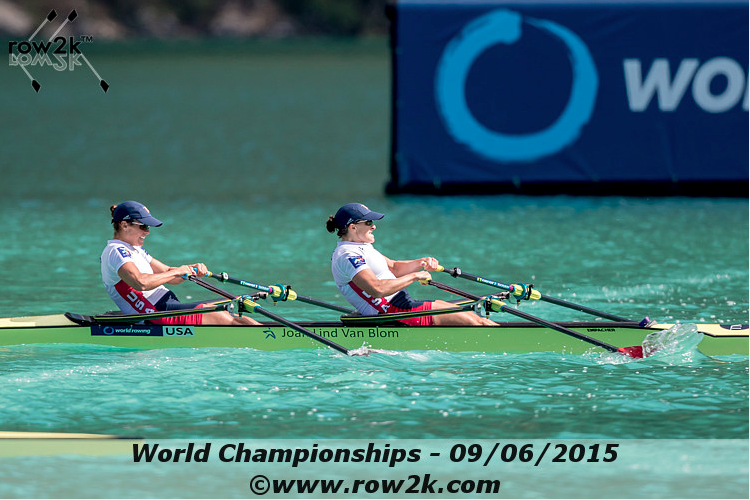 Additionally, the women’s eight added a record 10th consecutive World Title to their belts. The men’s team had a rougher regatta, but managed to qualify the four, pair, lightweight four, and lightweight double (which we did not qualify in 2011). All in all, the United States Rowing Team brought home five medals and qualified ten boats for the Olympics. What’s next? To break it down: While Ellen and I qualified the boat for the 2016 Olympics, USRowing holds separate selection procedures to fill the seats. So yes, exactly what you’re thinking. We did all of the hard work only to have to fight for it again in a few months. Some form of U.S. Trials are scheduled for mid-April to be held in Sarasota, Florida. USRowing has not finalized the 2016 Olympic Team selection procedures yet, so time will tell what that process entails. For now, we’ll regroup, get healthy, and recover. After a few weeks rest, we’ll dive into full training again to prepare for the Big One. There will be changes to how we approach next year to address some of the things that we learned from the year and particularly our World Championship experience. We did a lot of things right this year, but every year is a learning experience; I like to think that as long as we learn from those mistakes and make sure we’re improving upon them, we’re headed in the right direction. I’ll take 11th this year if it means we get it right next year. Thank you again for the continued support. 331 days until the 2016 Olympic Games. 331 days to get it right. So happy and proud of you!